September 4, 2018 — Comments are off for this post. I enjoyed reading a recent exchange between Alan Cooper and Jared Spool this weekend about this question: “What is the ROI of UX?” Alan Cooper argues that good design doesn’t have value–at least, not if the company and boss is seriously asking . From what I gather, Alan Cooper is an intelligent man whose work has impacted the industry for good, so I can’t believe that he is arguing that UX has no value–period. But I do think he’s arguing that the value should be assumed, and that the company has no need to be persuaded. If you have to persuade the company of the value of good design, Alan seems to be saying, then you have a choice: stay, or leave and find some place where your work’s value is seen. Jared Spool responds–rightly, I think–that yes, there is value, a “return on investment,” of UX–though not all design is valuable, and not all valuable design is equal. And he argues that Alan Cooper is presenting a privileged, and foolish, choice. It’s a privilege if we can just leave and find some place that values us–a privilege that not all designers have. And it’s foolish. By this, I mean it’s a “fool’s choice,” a term I’m borrowing from Crucial Conversations: it’s a false dichotomy, an “either/or” that ought to be replaced with an “and.” Can’t we stay and help others at our company see the value of our work? Of course we can. Jared Spool regularly argues for the value of UX here. Don Norman and Jakob Nielsen have a website, Norman Nielsen group, that is a great go-to place for new studies and evidences on the value of UX. For a more practical guide, Tom Greever has a whole book on the subject of communicating design decisions, a book I really need to read again. And Product Hive, my local group in Utah, has meetups that regularly discuss the value of UX, from both qualitative and quantitative perspectives. 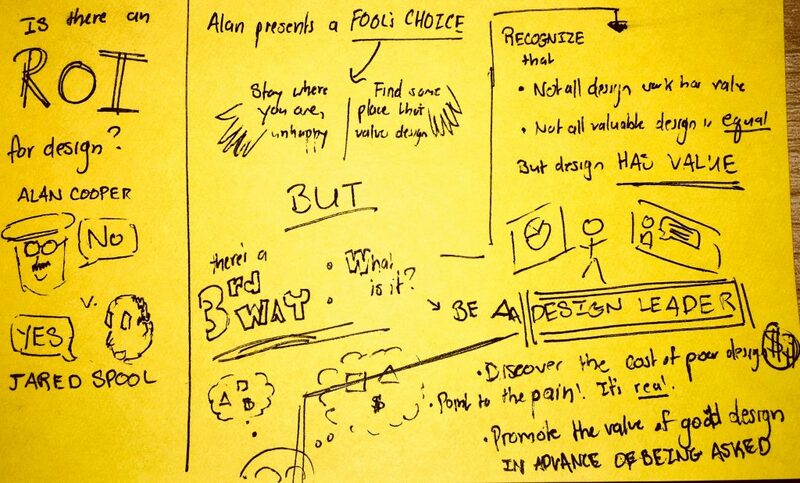 Jared Spool’s conclusion–his answer to his either/or question–is this: be a design leader. Be someone who can persuade others to see the value of the design work we do. A design leader finds where poor design is costing the organization money and pain. They start documenting it and put together ideas around what the design team could do differently to reduce those costs. When the boss comes to ask, the design leader will be ready with answers for them. They can tell their boss which poor designs cost their organization and how they believe they could fix it. Good ROI happens when the cost of fixing a problem is less than the ongoing costs of letting the problem continue. By having a ready plan, they’ll have the perfect starting point to discuss the ROI of design. I think there’s something to this. Obviously, finding “where poor design is costing the organization money and pain” is easier said than done. And I work at an agency / consultancy, where the rules are different: we work with a variety of clients, and I can’t change those clients minds in every instance. I can’t always argue on the strategical level, for a client’s whole company, that they need to reprioritize design. But in a way, this is a blessing: I have to argue on the tactical level–project by project, client by client, button by button and design by design–why this design matters. I’m forced, at an agency, to be incredibly concrete with my arguments, to argue for the value specifically, which is surely a powerful foundation to being able to argue for good design on a broader, more strategic level. And that’s what makes a design leader a design leader: they know how to communicate that value, to discover, uncover, and articulate it. Jared is implying that UX design is, generally speaking, very valuable. It has a return, and in cases where it’s well-practiced, a strong one. Whether it’s the costs of poor design, or the potential earnings of delightful designs, it does. I can’t forget that, and I can’t afford to let others, either.